At this point, the poop-filled waters of Rio's 2016 Olympic Games have been well chronicled. For the swimmers, divers, and pool-based athletes, however, the chlorinated waters of the Olympic aquatic center seemingly eliminated major health concerns. As many casual fans have observed on television and even more eyewitnesses have noted, the Olympic diving pools went through a metamorphosis from Sunday to Monday, with the pool's waters turning green. British diver Tom Daley noted the new emerald hue on Twitter, one of many tweets and posts about the color change of the 10-meter platform pool, which is called a diving well in pool parlance. Plenty of speculation flowed from there -- but the color grew from a buildup of algae, which the Rio 2016 Local Organizing Committee attributed to the high temperature and a lack of wind in the venue, according to CNN. The committee also stated the waters would be blue again for Wednesday's events, and that the water posed no threat to athletes, but as it turns out, the diving well wasn't the only pool to get gross. 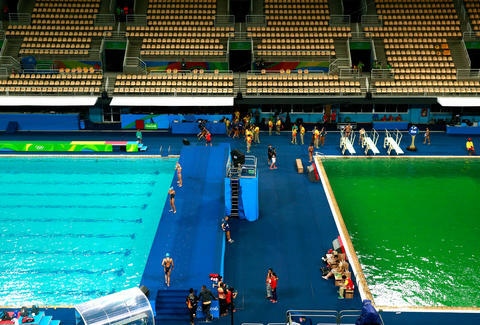 As Business Insider reports, now the Olympic Water Polo pool has turned green, too, and likely from that same algae bloom. It's not quite as deep a green in color, but it's notably not blue. Perhaps it's from all that underwater churning by the polo players' legs. Who knows. Officials have reiterated athletes are at no risk from the verdant waters of Rio's pools. Of course they'd say that. Doesn't make it any less worrisome. Anyway, now would be a great time for Rio's pool boys for hire to capitalize. Where's a cabana boy when you need one? Ryan Craggs is Thrillist's Senior News Editor. He's going to Rio later today. Wish him luck. Follow him @ryanrcraggs.